We haven’t done much camping this summer. Some of the opportunities to go just seemed to slip away from us, and other times we were committed to various bike-related activities to which we had promised our time. But, we did have lots of plans for modifications/improvements we wanted to make to the Fireball (our T@DA trailer), based on our spring trip. Everyone should be lucky enough to have a brother-in-law like Jerry. He’s a very talented woodworker, and has given freely of his time to help us with extended projects of all kinds. So, we turned to him for help in trying to manage our storage issues. After what we laughingly call “The Texas Enchilada Incident”, we debated for a long time whether to replace our microwave or not. Additional storage won hands down. How lucky for us that the maple hardwood flooring in their kitchen is a great match for our T@DA interior. 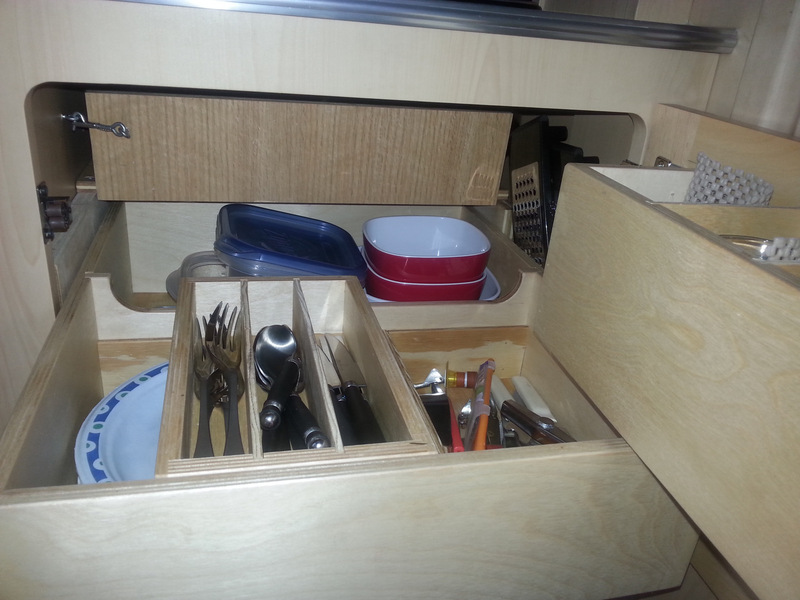 Check out the nifty sliding drawer that now fills the space above our fridge. Jerry also finished off the left interior edge so that the wires from the TV, DVD, etc are covered up. We LOVE this space. The low front edge keeps everything in. Nothing has fallen out, even on some pretty rough roads. The slide lets us grab stuff from the very back without taking anything out first. The other area which really needed attention was the single cabinet (for us, the one below the stove) in which we store all of our pots, pans, plates, glasses, silverware and other sundry stuff. The shelf we put in place didn’t really do the job, and we had a mess of silverware and utensils with a big gap of unused space above. 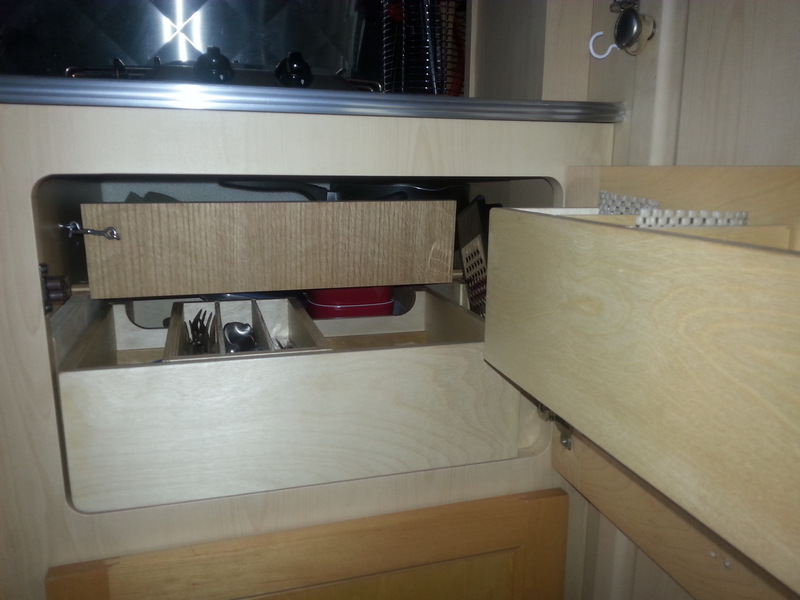 Jerry neatly solved this problem for us by putting in another sliding drawer. The front section is divided so that we have plates on one side, and a double-decker sliding box for silverware and utensils. The pots & pans are above on a little shelf, which has a front piece which latches up for travel to keep them from sliding onto everything else. Lastly, a box on the door keeps a couple of little plastic cups into which we nestle our two favorite little wine glasses. Leaves one spare compartment for measuring cups (bulky) and the tablecloth clips. We love this cabinet now. 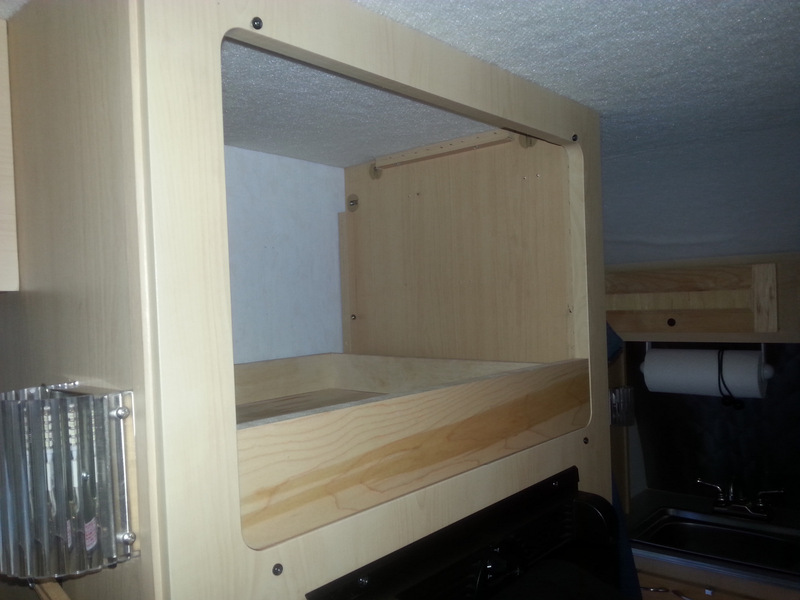 Sliding compartments keep help us make better use of some of the vertical space. Pots and pans on the shelf. 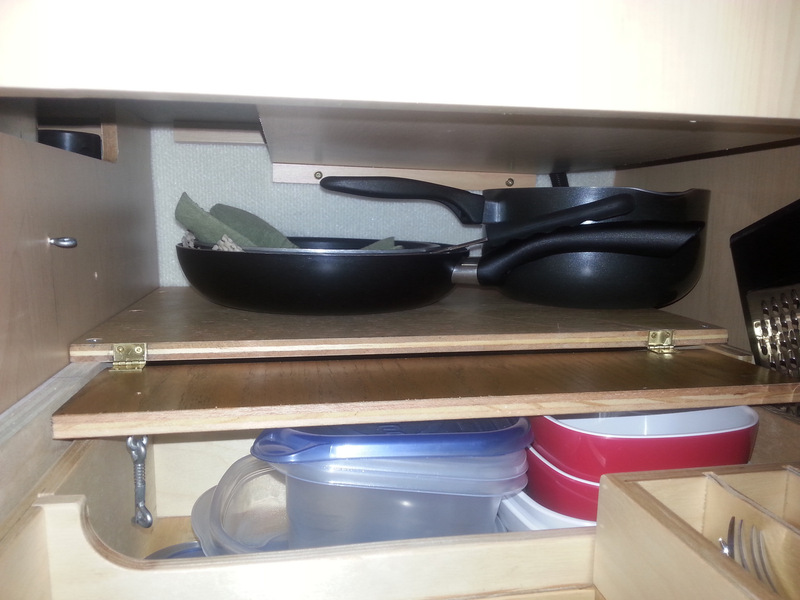 We have another larger frying pan stowed here, which is not shown in photo. Lid storage on the door of the cupboard below the main one. Held in with Command Hooks. One of the other things that needed attention was the Cool Cat outside. John wanted a protective cover, to keep both road crap and pests out. We had installed a temporary fix of a piece of aluminum, but it looked like heck. John was itching for a better solution. He had a difficult time finding a source for a thin sheet of plexiglas to cover it with, but finally found a plastics manufacturer locally who sold him a pice, but to size. He secured it with draw clasps for a snug fit. Looks great, and keeps this vulnerable area more secure. Love how tidy it looks. Two more draw clasps were added (one each top & bottom) since this photo. We’re ready to hit the road. Bring it. 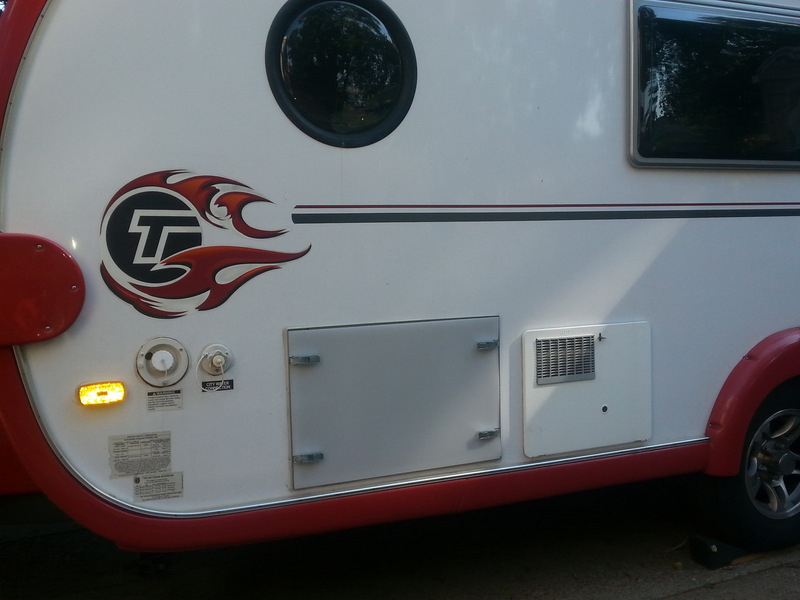 This entry was posted in retirement, RV life, simple camping, T@B, T@DA, trailer modifications and tagged camping, retirement, road trip, RV life, simple camping, T@DA, the great outdoors by Judy Crankshaw. Bookmark the permalink. Love the mods. Enough storage space is a problem. In a few years we’ll be using our t@da to winter in warmer places. Some of the little cubby holes aren’t too useful, are they? We find ourselves cramming them full of useless stuff because that’s all we can get in there. Trying to get better about that. Masterpieces for sure. 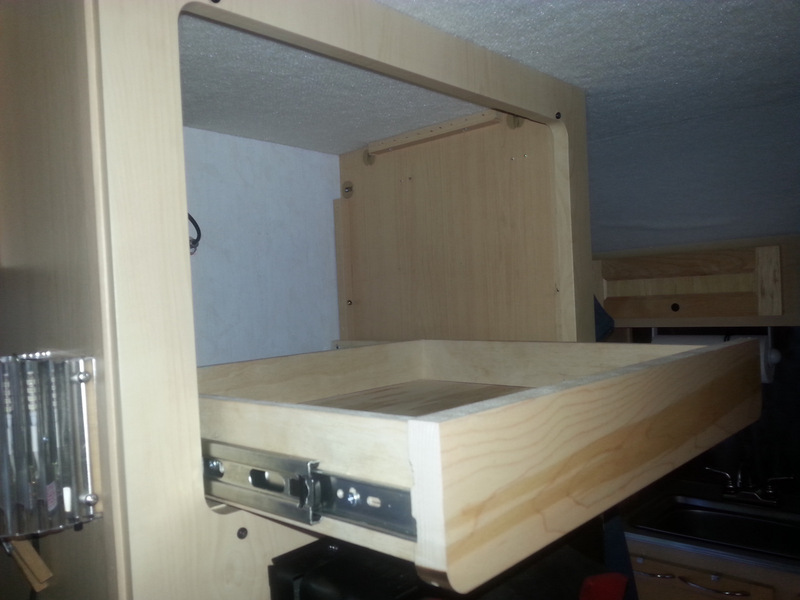 What perfect storage ideas….and to be created by a master woodworker! Hoping some Fall trips on the menu Judy! We’re heading to Maine in a couple of weeks. Looking forward to seeing a new part of the country. I am bowled over by your gorgeous mods. The only one I might be able to copy is the lid storage–which is beyond brilliant! Wish I could take credit for thinking of that, but I had seen posted somewhere else long ago, and always kept it in mind. 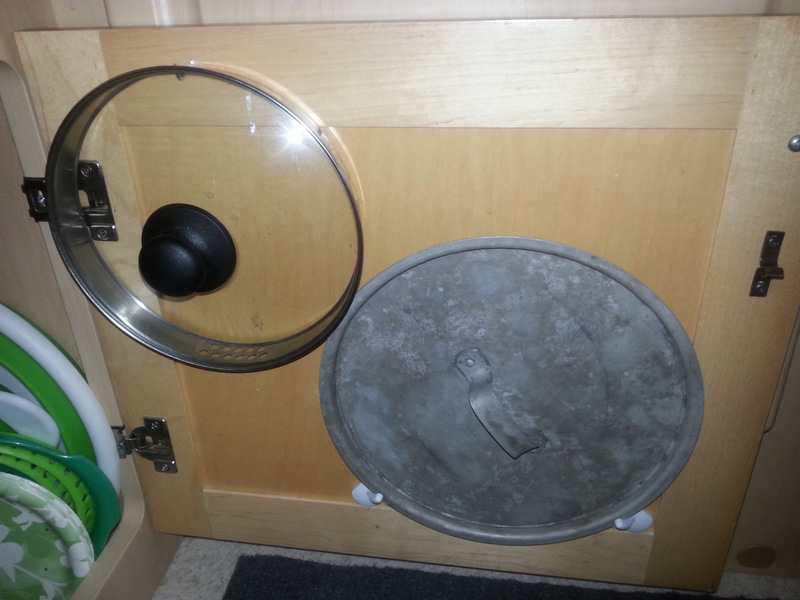 We were lucky that our lids just happened to fit on one door, because they are a big pain to store elsewhere. Jochen, I think we can squeeze you in. Warning….it won’t be pretty! Wow! I need a handy dandy brother-in-law like this. I’ve got all the tools, just no strength to do neat projects like this. Looks great! Jerry’s the man! Does He have a brother? Looks awesome Judy! Think Jerry’s brothers are all spoken for. I’m always so impressed with how he can see his way through a project like this. Wonderful for us that he’s always so happy to help.